Miniature Schnauzers were originally developed in the 19th century in Germany where they were used to guard livestock and chase vermin. Their name is derived from the word “Schnauze” which means “muzzle.” They were developed by cross breeding small Standard Schnauzers with the Affenpinscher or Poodle. They still make a good watchdog today, but their primary function is that of a household pet. This little dog is very intelligent and easy to train. They are active, alert, spirited, friendly, and loyal. Since they were bred to chase vermin, they can be aggressive towards small animals. They are extremely protective and want to please their family. As with any dog, you must teach young children how to properly play with them to avoid any unintentional injuries. Miniature Schnauzers usually weigh between 10 to 18 pounds, and their height averages between 11 and 14 inches tall. They have a square-shaped body that is surprisingly muscular for such a small dog. Their ears may be cropped to stand erect or left long to fold over. Eyebrows on a Miniature Schnauzer are distinctive and arched, and their whiskers are long and the fur grows into a “beard” on both sexes. Traditional colors of Miniature Schnauzers are black, black & white, or salt and pepper with their coat being wiry. 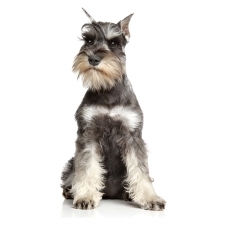 Miniature Schnauzers are the 6th most popular dog registered with Americas Pet Registry Inc. As this little dog doesn’t shed much, they are considered hypoallergenic. According to Stanley Coren in his book The Intelligence of Dogs, the Miniature Schnauzer rates under “Excellent Working Dogs” as number 1 with understanding 5 to 15 repetitions of new commands and obeys the first command 85 percent of the time or better.